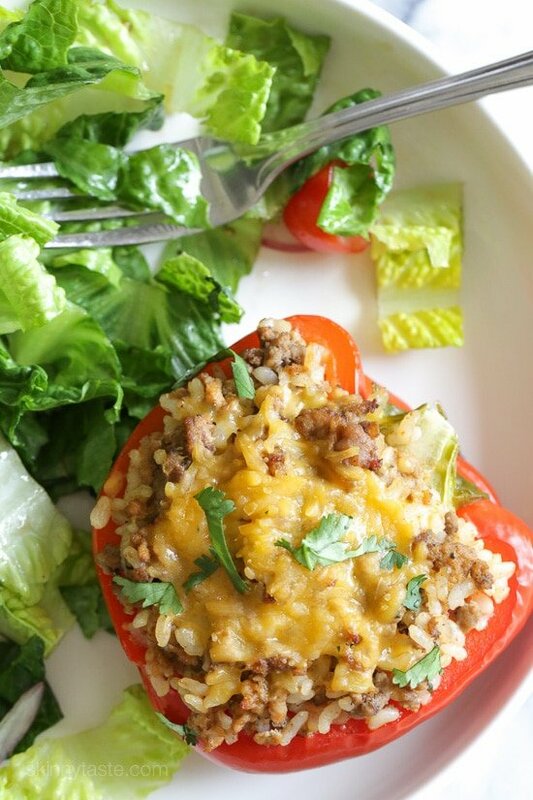 I love stuffed peppers stuffed with just about anything, but these turkey stuffed peppers filled with ground turkey and brown rice, seasoned with cumin and spices and topped with cheese are my favorite! Stuffed Peppers are my jam! You may have tried my Sante Fe Turkey Stuffed Peppers, Chicken Taco Chili Stuffed Peppers, and of course the popular Stuffed Pepper Soup! This stuffed pepper recipe is an oldie, and one that I’ve always loved which I first published back in 2008. They kind of remind me of a burrito only stuffed in a pepper instead. One half with a salad on the side is very filling for me, my husband Tommy enjoyed two. Madison is 6, so peppers aren’t her thing so I scooped it out for her and she loved it. Make extra so you can have leftovers for lunch! Lightly spray olive oil spray in a medium nonstick skillet and heat on a medium heat. Add onion, garlic and cilantro and saute about 2 minutes, add ground turkey, salt, garlic powder, cumin and cook meat for 4 to 5 minutes until meat is completely cooked through. Add 1/4 cup of tomato sauce and 1/2 cup of chicken broth, mix well and simmer on low for about 5 minutes. Combine cooked rice and meat together. Cut the bell peppers in half lengthwise, and remove all seeds. Spoon 2/3 cup meat mixture into each pepper half and place in a 9 x 13-inch baking dish. Top each with 1 tbsp cheese. Pour the remainder of the chicken broth on the bottom of the pan. Cover tightly with aluminum foil and bake for about 45 minutes. Carefully remove the foil and serve right away. 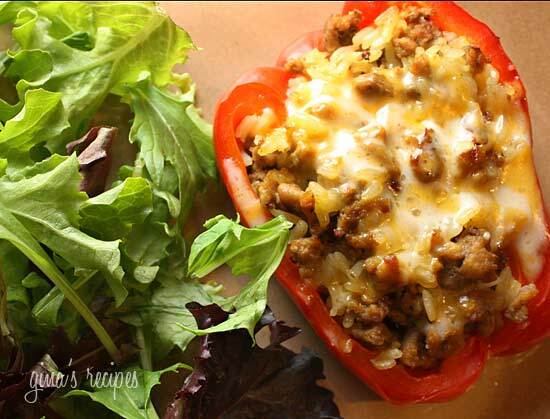 This is, by far, THE best healthy stuffed pepper recipe I have made. I followed recipe as written-you can’t go wrong! 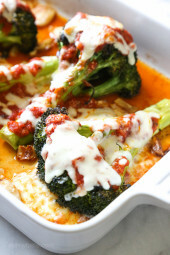 Thank you for my new “go to” when I’m craving comfort food! Really good. I used instant brown rice with quinoa. Added Italian spices such as red pepper, basil and Italian seasoning. Always use a dash of Worcestershire sauce. Topped with some left over sauce(used tomatoe with Italian seasoning). Cooked and put half slice of provolone cheese at end. Cooked perfectly. Will keep making. These are really good. 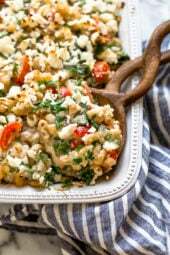 My husband (who is used to more traditional “comfort food”) liked them also; we are trying to lose some weight, and so are looking for satisfying dinner dishes such as this. No doubt we’ll make them again! Thank you. Is the 5 points for 1/2 of pepper or whole? These are great and super flexible. I went an Italian route since that’s what I had on hand. But I went with Michaels of Brooklyn marinara that I’ve been obsessed with lately. Sprinkled the turkey with Italian seasoning and red pepper flakes. Subbed out the rice for quinoa and added some kale and then topped them off with Parmesan. These are delicious and are great for lunch the next day!! Could I freeze the meat/rice mixture and thaw it, add to peppers? I never leave comments. But these were AMAZING. This comes from someone who doesn’t like cilantro. But it compliments all the flavors so well I didn’t even mind it! Super easy and will definitely be in my regular rotation now! I started on WW Freestyle about a year ago & came across this recipe on a website. Made it for my husband (picky eater) & I and we both really liked it. Have made it a few times since. Love the spice mix as it tastes so much better than other recipes we had growing up. Also pretty easy to make…. We have to have cheese on top as it tastes so much better. Do I need to use tomato sauce or can I use salsa instead? Thanks! Great recipe! 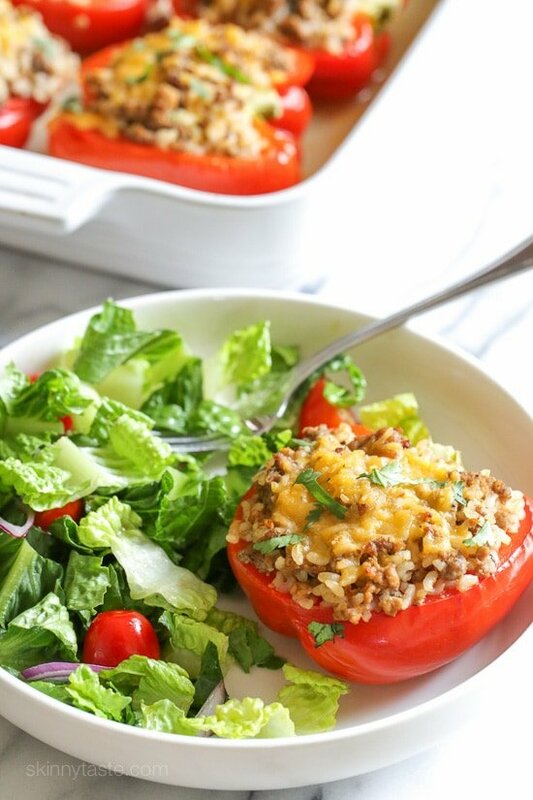 We love all manner of stuffed peppers-lentil and spinach was our favorite until we tried these! If your family doesn’t care for ground turkey, try it with ground chicken. It has a lighter yet still ‘meaty’ taste. This was a very delicious recipe. I used cauliflower rice instead of brown rice. Not only that….it was very fulfilling. Can these be cooked the night before and warmed in the microwave for lunch? would these be ok to make the night before and then cook? thanks Gina! I really loved this recipe. I substituted quinoa for the rice and it was delicious. Great tasting, healthy, stuffed peppers. We have made it multiple times and have been thrilled with the results every time. Easy to clean up. I love this recipe, can you please tell if I should freeze peppers after baking or before? Can I make the meat and rice mixture and freeze it for use later? This recipe is incredible! I used pre-made Mexican seasoning instead of measured spices, used Rao’s marinara sauce instead of just any marinara sauce, and I used quinoa instead of rice. So delicious! These are absolutely amazing! Very delicious. Looked up a recipe to use ground turkey in and found this. You made my day! The family loved them! I really loved the recepie. I used Turkey sausage instead and added Buffalo rub into the meat. I also used queso molido cotija (aged part skim milk cheese) on top of pepper. And I used wild blend rice instead because I had it left over. It was the best stuffed peppers I ever tried. Thank you so much. 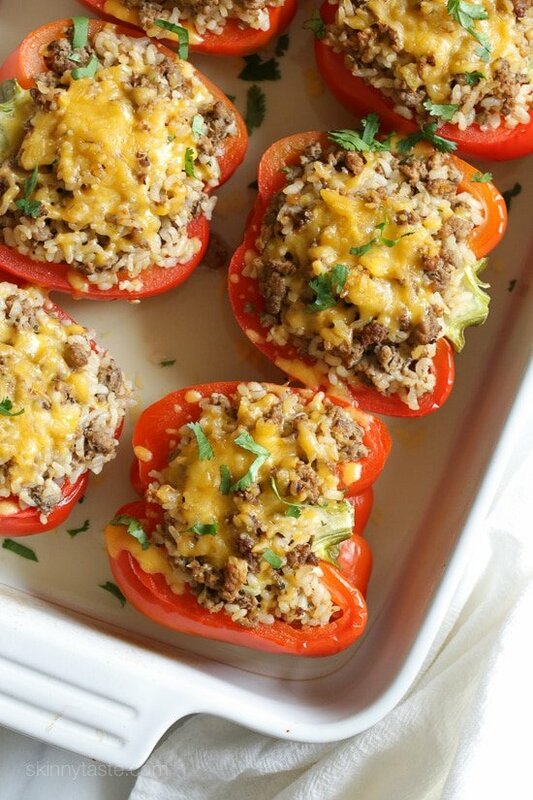 My family LOVES stuffed peppers, but I’m not a fan of ground turkey. We do like southwestern tastes, so loved your idea of the Buffalo rub–I often add diced green chilis to the rice stuffing along with the garlic, onion–and cilantro! Another way to create a southwestern version is add a handful of corn kernels and/or leftover beans of any sort. 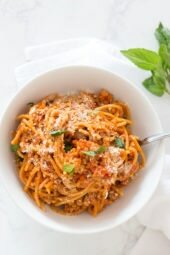 For a meat or protein, I usually chop up leftover cooked meat instead ground meat–although if I have chorizo in the house, that’s yummy, too. It’s a great way to use up rotisserie or leftover grilled chicken. 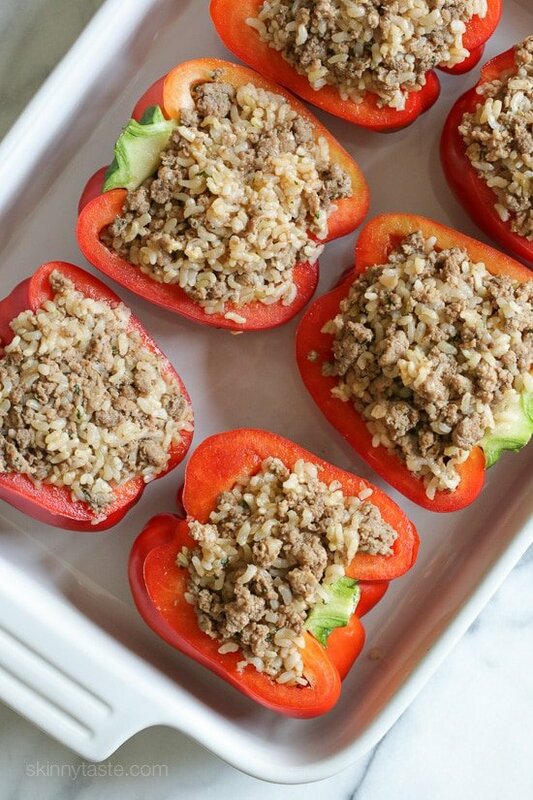 We enjoy soy crumbles as a ground beef substitute, and when my vegetarian daughter is present, those star in our stuffed peppers.